Talk about a difficult topic. There are few men in all of history who have had the impact that the Evil One had, yes, Adolf Hitler. In Israel when we mention his name it is always followed by Yemach Shmo, which means May his name be obliterated, but for the sake of brevity I will omit that for now. Perhaps no man in history has had so many books written about him, perhaps no man in history has been so analyzed. People want to know and understand him; what motivated him, where did his hatred and brilliance and daring come from? What can we learn from his behavior and better prepare us in the future against such evil? There is no doubt he was a highly unusual man. There is no doubt that he was different. Perhaps he was somewhat insane, as mental disorders did indeed run in his family. But he was also, in many ways, head and shoulders above the common man. As he said his will was greater than that of others and he saw and did things that lesser men were incapable of. Yes, this is all true. No doubting his evil but no doubting that was an usual man. Some call him an evil genius. Some call him a madman. But lets face it; he outsmarted most of the world. He outwitted all the European leaders and for years he had all of Europe on the run. He captivated the German people. He was indeed "Special", there is no doubting that. One of his early supporters, Ernst Hanfstaengl, said about him that the way he controlled a crowed was something that no one would be able to in 10,000 years. I have of course seen many video clips of Hitler delivering speeches and I have seen many actors try and portray Hitler in films. In my humble opinion all have failed miserably. No one, even the greatest actors, can capture his essence, his passion, his ..unspeakable qualities. As hard as they try they cannot capture this man, they lack his essence. Please excuse me if this comes across as admiration. Of course it is not admiration but understanding that we are dealing with a world class player, a truly evil man who in his own way stood head and shoulders over the other European leaders and left them guessing. It took the world years to realize who they were dealing with and by then it was very late, so late that it cost the world the most terrible destruction. "Peace in our times" was momentarily achieved while the madman laughed at all those lesser humans who simply could not grasp what he was all about. His affect on his audience was beyond what any other man could achieved. I will certainly not attempt here an analysis of this most evil of men. I just wish to say the world faced a formidable opponent for which it was entirely not prepared. What I wish to focus on now is one minor detail in Hitler's life, one that I believe is not known to most people. Hitler, to his last day, always wore his Iron Cross, always. But where did he get it? How did he earn it? And who gave it to him? The person who recommended him for the Iron Cross was a Jew, his commanding officer. He never forgot this Jew. Hitler once remarked that it seems everyone in Germany understood that the "Jews are our misfortune" but that every German knew at least "one decent Jew" and if he allowed each German to protect "his one decent Jewish friend" the entire genocidal program would fail. Hitler was closely associated in his earlier years with at least two "decent Jews". Eduard Bloch (30 January 1872 – 1 June 1945) was a Austrian doctor practicing in Linz (Austria). Until 1907 Bloch was the physician of Adolf Hitler's family. Hitler later awarded Bloch special protection after the Nazi union of Austria and Germany. Dr. Bloch was an assimilated Jew and cared deeply about his community. He was known to serve the poor (regardless of religion) and often charge little or nothing. Bloch charged reduced prices, sometimes taking no fee at all. The then 18-year-old Hitler granted him his "everlasting gratitude" for this. ("Ich werde Ihnen ewig dankbar sein"). This showed in 1908 when Hitler wrote Bloch a postcard assuring him of his gratitude and reverence which he expressed with handmade gifts, as for example, a large wall painting which according to Bloch's daughter Gertrude (Trude) Kren (born 1903 in Austria, died 1992 in the USA) was lost in the course of time. Even in 1937, Hitler inquired about Bloch's well-being and called him an "Edeljude" ("noble Jew"). Bloch also apparently had a special fondness for the Hitler family which was to serve him well in the future. The 62-old Bloch then wrote a letter to Hitler asking for help and was as a consequence put under special protection by the Gestapo. He was the only Jew in Linz with this status. Bloch stayed in his house with his wife undisturbed until the formalities for his emigration to the United States were completed. Without any interference from the authorities, they were able to sell their family home at market value, highly unusual with the distress sales of emigrating Jews at the time. However, they were allowed to take only the equivalent of 16 Reichsmark out of the country; the usual amount allowed to Jews was a mere 10 Reichsmark. In 1940 Dr. Bloch emigrated to the USA and lived in the Bronx, New York. He passed away in 1945 and merited to be buried in a Jewish grave, a privilege denied to most of the Jews of his town and of all of Europe. The doctor later wrote about his now famous patient and describe him in a rather positive way, denying any obvious evil flaws. "This simply is not true. As a youth he was quiet, well mannered and neatly dressed. He waited patiently in the waiting room until it was his turn, then like every 14- or 15-year old boy, bowed as a sign of respect, and always thanked the doctor politely. Like many other youngsters of Linz, he wore short lederhosen and a green woolen hat with a feather. He was tall and pale and looked older than his age. His eyes which he inherited from his mother were large, melancholic and thoughtful. To a very large extent, this boy lived within himself. What dreams he dreamed I do not know." Clearly Hitler admired this doctor and repaid the good doctor's kindness with his life. Hitler saved the life of his "decent Jew". 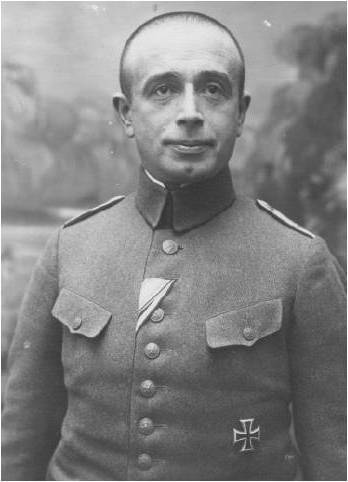 Hugo Gutmann in 1917, proudly serving in the Bavarian army (under the command of German Army). Throughout most of 1918, from January 29 to August 31, Lt. Gutmann served as Adolf Hitler's direct superior. Gutmann later recommended Hitler's award of the Iron Cross First Class (a decoration rarely awarded to one of Hitler's Gefreiter rank). The unofficial story is that Hitler manipulated and blackmailed Gutmann into recommending him for the iron cross. He suggested that he, Hitler, was protecting Gutmann from the antisemitic troops and defending him. The implications were clear. The decoration was presented to Hitler on August 4, 1918, near Soissons, by the regimental commander, Major von Tubeuf. Hitler would wear this medal throughout the remainder of his career, including while serving as Führer of Nazi Germany. Gutmann himself was an Iron Cross recipient, having been awarded the Iron Cross 2nd Class on December 2, 1914 (incidentally the same day as Hitler), as well as the Iron Cross 1st Class on December 4, 1915. In 1938, Gutmann was arrested by the Gestapo, but released as a result of the influence of SS personnel who knew his history. In 1939, Gutmann and his family left for Belgium just as World War Two was beginning. In 1940 he migrated to the United States just prior to the invasion of the Low Countries. Again we see that while Hitler was destroying the Jewish people, he too knew a couple of "decent Jews" whom he wanted to save.